The MOTHER GÜELL RESIDENCE HALL for young students is located in the Sarriá district, at 5-7 Esperanza Street, which is parallel and immediately above Bonanova Promenade, between the streets Iradier and Pomaret. It belongs to San Viçens de Sarriá Parish. 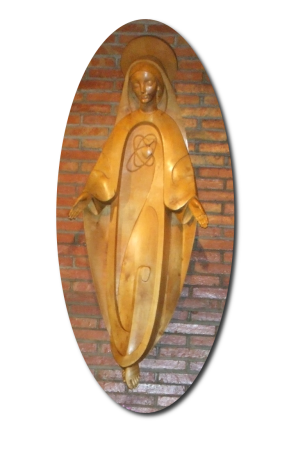 Our religious community, which serves the Residence Hall, is a part of the Congregation of Missionary Daughters of the Heart of Mary, founded by the Venerable Mother Maria Güell and Puig at Cervera (Lleida) in 1899. Not only did many young women move from other places, such as Barcelona surroundings, especially Catalonia, but also from Spain and other countries. The possibility of being received in a residence hall looked after by nuns could be a great good for them. In this way, our university housing was set up. Since the beginning, the purpose of founding the Residence Hall was the hope that this would become an apostolic-social work where young students were able to find a quiet and familiar environment that favoured their human and Christian life. The religious Congregation of the Missionary Daughters of the Heart of Mary is aware of the charisma of its founding mission, bequeathed to us by the Mother Founder: it is based on charity and the love for God and our brothers practised with humility and simplicity. The community mission meets the charismatic Christian identity with service, doing good, “according to current needs in the world and in the Catholic Church”. Our community was so lively with such principles that it achieved a piece of land and built the whole of the present residence. The project resulted in a very well-made building; in fact, it deserved the FAD (Fostering Arts and Design) reward in 1967. Since then, some student promotions, either in groups or individually, have visited our Residence Hall periodically to know in detail about some of its considerable features and take notes. After the building had been finished, the religious community was established in 1967, with prior approval and blessing of Barcelona’s bishop Monsignor Marcelo González Martín. The Mother GÜELL Residence Hall for female students opened its doors in Barcelona in the academic year 1967-1968. The welcome and support to young students is a very estimable aspect of our mission. We try our young students are able to find either a calm atmosphere to study and rest, together with a familiar environment and peaceful cohabitation in our home. In collaboration with their parents, we always attempt to help hem and look out for their health and timing needs, as well. Therefore, we offer them a prepared house: both single rooms and study areas where they can share study and work with other colleagues. The university house is provided with Internet access, a library, a garden and an assembly hall. And, as a means for a religious experience, having respect always for the existing different beliefs and, especially for their freedom, we have a chapel available for them all, as a meeting place for praying in the daily Holy Mass, etc. Some specific days during the course, a celebration of it is held in our Chapel: at the beginning of the academic year, in preparation for Christmas and Easter celebration and some other events that might arise. Their free will is always respected.